Useful and not-so-useful projects for family, fun, and home. 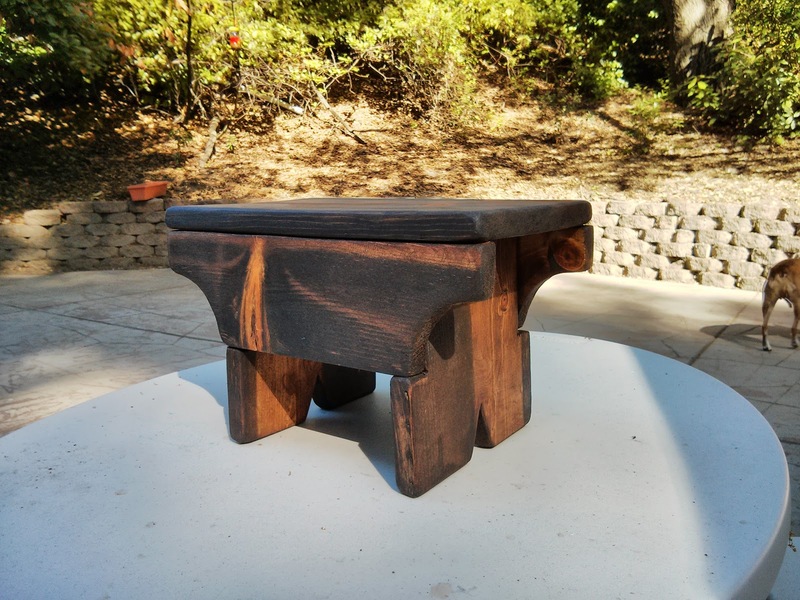 This is a little short stool modeled after one we have in our kitchen in Ireland. It is a really basic design, made entirely of one 1''x8'' board (I got an 8' board, but didn't use the whole thing). I made this for my dad, as an early father's day gift, and you could make it in less than 30 minutes! One of the 12" lengths will be ripped lengthwise, and the curve detail will be cut with a jigsaw. This stool can also be made with straight design details, if you don't have a jigsaw. Trim the curved corners of each apron. I used a compass to make a nice curve that I could then replicate 3 more times. Cut a triangle out of the bottom of each leg. Make them even and matched to each other (unlike my drawing above). Sanding! To make this look really old and used and rustic, you need to sand all the corners way down. Do this before assembly, so that it looks like it may have been built out of old reclaimed wood from the farm. If you want some nice wear and tear on it, you can use a hammer, or even a chain and beat it up a little before assembly. Assembly! Choose the best side of your 12" by 8" top board, and put the top face down on your work surface. Line up your first apron along the side, and either use pocket holes with your Kreg Jig, to fasten from below, or countersink screws from above into the apron. Do this to the other apron as well. Slide a leg in between the aprons and position it so that the 4" wide part of the apron sits on the notch of the leg. Use pocket holes to fasten the leg to both the top and the aprons. Repeat with the other leg. Here is the underside of the stool; you can see where the leg placement goes for full support. When you are done, you can fill the holes with wood filler, and then stain and seal. I used Minwax oil-based stain in Hickory, and then a light wax finish at the end. For an even more rustic look, you could assemble with finish nails. Often, little stools will also have an oval hole cut out of the top for a handle. That's it! Enjoy the stool as a toddler's hand washing helper, a place to prop up your feet, something useful with which to hold a french door open, or as a nice little low table on which to rest your beverage. Copyright except where noted, content on this site is licensed under a Creative Commons License. Picture Window theme. Powered by Blogger.